The Stall Butler eliminates the time, and frustration of shaking your pitchfork to separate manure from good shavings. It is a breeze to use and will pay for itself in no time! How Did The Stall Butler Come To Be? When horse lover and inventor, Jon Myers, turned 50 and decided that he wanted to buy a horse. Within a few months he had bought his two horses. While doing his daily chores taking care of his horses he realized the aches and pains he was feeling were coming from the time he was spending shaking a muck fork and not the limited amount of time he was riding his horses. Jon had invented many items over the years to solve a variety of problems so it seemed only natural to him to build a machine to “Make life easier one pile at a time”. With that thought in mind he began work on the STALL BUTLER. He had started out with a electric model which required a long electric cord. Jon decided that there were too many risks to other horses moving up and down the aisle in the barn with this version as the cords were under foot. So he went back to the drawing board. After many tweaks here and there the STALL BUTLER has been in use for over a year. 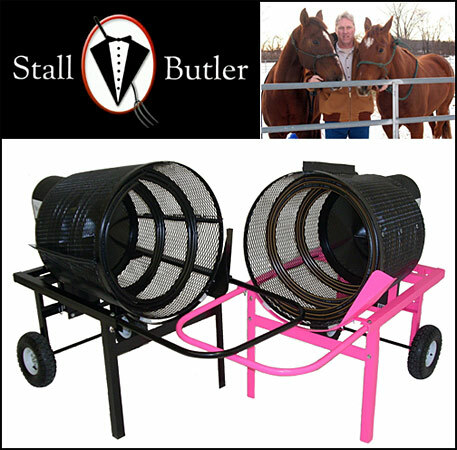 The STALL BUTLER is a product of Over The Hill Equine, LLC created by founder Jon Myers. It is a battery powered machine that separates the stall bedding from the manure in half the time as a muck fork. It reduces the stress on your body. What Is The Stall Butler and How Can It Help Me With My Stalls? The Stall Butler is a machine that eliminates the tedious task of shaking a fork. If you prefer to spend time enjoying your horses rather than cleaning up after them, then this is the machine for you. It is a highly portable machine that is battery powered, making it easy to maneuver around your stall without tripping over a cord. The machine thoroughly cleans your bedding material, making it last longer, removing pieces as small as a marble. It will save you money on bedding costs and reduce your time spent cleaning; the machine will pay for itself. The machine works with all pelletized bedding products and other fine bedding materials. What Advantages Does The Stall Butler Offer Me? No need for cords or multiple electrical outlets- battery operated! Saves time spent cleaning your stall. Aerates and fluffs stall bedding so it can be used longer reducing cost. Reduces amount of physical stress on the body. Gives you a cleaner stall than a pitch fork! Is It True That The Stall Butler Can Help Me Save BOTH TIME and MONEY? Oh yes... that was the whole point of it's creation! The Stall Butler is designed to help speed up the messy process of cleaning stalls. It will cut your cleaning time in half, and help you preserve the good shavings by separating the manure from clean shavings-- thus giving you more time to enjoy your animals and less money to spend on shavings!Why waste your day away cleaning up after them when you could spend the day out riding them? The Stall Butler, with its patent pending design, will generate enough savings to pay for itself quickly. Once you get your Stall Butler home you won’t know how you did without it. Don't YOU Deserve More Time To Do The Things You Enjoy With Your Horse? Don't be a 'barn slave' spending hours bent over your pitchfork trying to separate every last piece of good shavings from your manure-- at only $1850 (less than $2000!) you can SAVE MONEY on Shavings, SAVE TIME on barn chores, and if you horses are a business, The Stall Butler is a tax deduction that is well worth it. You won't know how you ever got along without it. Call and talk to Jon today-- we'll help you with your order and get you enjoying a great life with your horses!